The anchors that hold the straps to the back of the turtle can detach, posing a choking hazard to young children. 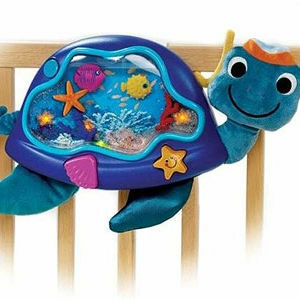 The recall involves about 15,000 turtle-shape crib toys made of plastic and stuffed fabric with a toy aquarium body that has woven fabric straps that attach to the side rails of a crib. The toy turtle has a stuffed fabric head and feet. Model number 30858 is printed on the label on the leg of the turtle. Only crib toys manufactured in October 2007 with date code BJ7 printed on the back of the battery compartment are included in the recall. Discount department stores and online retailers nationwide from November 2007 through January 2008 for between $25 and $30. Stop using the recalled crib toys and contact Kids II to receive a free replacement toy. For additional information, contact Kids II toll-free at (866) 203-6788 between 8 a.m. and 5 p.m. ET Monday through Friday or visit their Web site at www.kidsii.com.